The scariest movie of all time, it has a reputation of the cursed film. 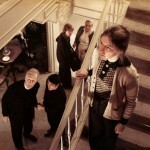 That’s why the film makers even invited a priest to bless the set place. By the way, the priest came several times. Strangely enough, nine people associated with the production of the film, died. 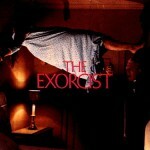 In addition, once, on the weekend the fire destroyed all the scenery of The Exorcist. However, the cause of the fire has remained unknown. 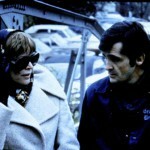 Besides, actors Jack MakGouran and Vasiliki Miliaros died shortly before the release of the movie. 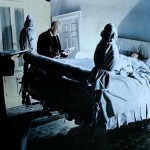 According to Christian evangelist Billy Graham, the film was possessed by a devil. By the way, about 80% of the film – based on real events. Meanwhile, the movie in 1973 accompanied mass hysteria, with fainting spectators during display and “ambulance”, that was on duty near the cinemas. Also, after the film, Linda Blair received a great number of death threats on her address. As a consequence, Warner Bros. company had to hire bodyguards for six month to protect her after the film’s release. Meanwhile, Stanley Kubrick wanted to make a film, but only on condition to be also one of the co-producers. However, the owners of the studio became concerned that Kubrick could go beyond the budget and shooting schedule, so they hired director Mark Rydell. 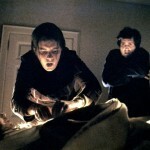 Besides, Bletti (writer and author of the film) insisted on William Friedkin. 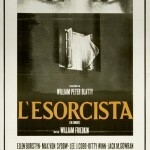 The film was shot on bestseller by William Peter Blatty from his 1971 novel of the same name. 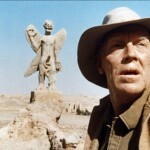 In September 2000 came into wide release restored version of the film, which included 11 additional minutes, and the film was touted as “the version you’ve never seen before.” By and large, the restoration of the film cost $ 1 million, but for the three months rent received $ 39.6 million. 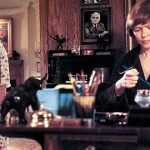 On the role of Chris, mother of Regan, which eventually went to Ellen Burstyn, claimed Jane Fonda and Shirley MacLaine. Besides, Audrey Hepburn would be willing to play the role, if the shooting took place in Rome. Also Anne Bancroft could play as Chris, but “left behind”, as she was in the first month of pregnancy. Finally, Ellen Burstyn agreed to star in the film, provided that her character will not utter the sentence, “I believe in the devil!” as required by the script. The producers agreed and decided to remove this sentence. Agencies representing the interests of Linda Blair, did not recommend her for the role of Regan, and more than 30 other young actresses had been proposed. As a result, only the intervention of the girl’s mother allowed to solve the problem. The archaeological excavations in the film was not the scenery, but the actually existing terrain in ancient Parthian city of Hatra in northern Iraq. Friedkin for shootings in Iraq had to assemble the film crew, consisting solely of the British, because at that time the United States were against Iraq and had no diplomatic relations. Iraq agreed, but with the condition that in the filming will take part Iraqi filmmakers. 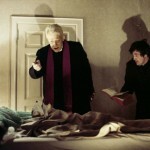 In the exorcism scene in the bedroom, the temperature was strongly reduced in order to achieve a true “ice” breathing. Linda Blair, who was still wearing only a light shirt, admitted that on that day she could not even stand – so cold she was. In the bedroom, there were 4 air-conditioners, and the temperature was about 1 to 4 degrees below zero. 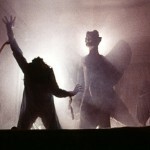 The film was shot in a house where once lived William Peter Blatty as a student and studied at Georgetown University. 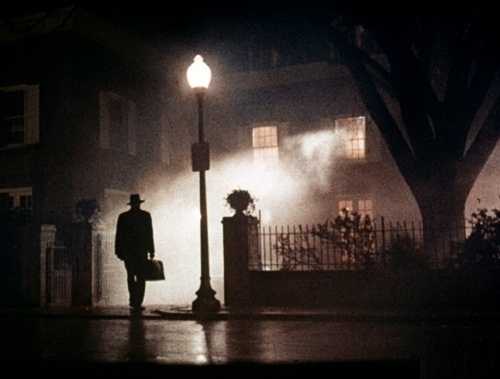 William Peter Blatty once won $ 10,000 on the Groucho Marx show “bet – your life.” When the host asked what he will spend money for, Blatty replied – “writing a novel” – this novel was “The Exorcist,” published in 1971 and became a bestseller. 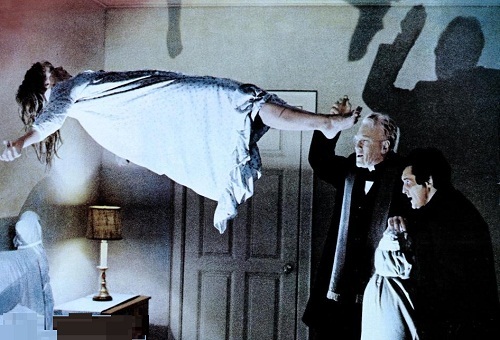 The inspiration for writing the book by William Peter Blatty found learning about the real case of exorcism, which occurred in 1949. The writer, while studying at Georgetown University, read an article by Bill Brinkley in the newspaper «Washington Post» (August 20, 1949), about the case of exorcism that took place from 13-year-old boy on the mountain Raynor, Maryland. Father Albert Hughes and Father William Bourdern conducted ritual exorcism of Roland Doe (not her real name) in January – April 1949.